I sometimes say that in a past life I worked in the entertainment industry, comedy in particular. I co-wrote and co-produced novelty records THE HOMECOMING QUEEN’S GOT A GUN, I LIKE EM BIG AND STUPID and EARTH GIRLS ARE EASY all performed by Julie Brown. I directed comic music videos for some of these songs, and ended up co-writing and co-producing the film EARTH GIRLS ARE EASY. I’ve produced and hosted this show since 1996 and I consult and speak primarily to non-profits and foundations, working with them on communications, encouraging them to tell better stories. 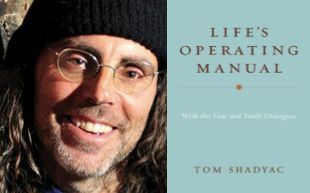 My transition seems mild compared with that of this week’s guest, TOM SHADYAC, whose phenomenally successful writing/directing/producing career included the hits- ACE VENTURA: PET DETECTIVE, LIAR LIAR, THE NUTTY PROFESSOR, BRUCE ALMIGHTY, and PATCH ADAMS . His films grossed nearly $2 billion and earned him four People’s Choice awards and a ton of money. His 2011 documentary, I AM recounts what happened after a cycling accident left him incapacitated for months. Though he ultimately recovered, he emerged a changed man. In the film, Shadyac meets with a variety of thinkers and doers including David Suzuki, Noam Chomsky, Howard Zinn, and Archbishop Desmond Tutu – asking what’s wrong with society and what can we do make things better? Tom’s now written a book, LIFE’S OPERATING MANUAL, which asks whether life comes with a set of guidelines? If so, what are they? And finally, do we have the courage to pay attention and to change? Rather than spoil the plot by telling you his answers, join us for the conversation. Our life on earth depends on a most unlikely love affair – one between flowers and the bees, butterflies, birds and bats which enable plants to reproduce. The brilliant colors and exotic perfumes of flowers are designed to lure their pollinators into an intricate dance of seduction, a dance on which more than one third of our food crops depend, a dance without which we could not survive. If you’re lucky and observant, you’ve witnessed the visits of bees and those marvels of engineering, hummingbirds, to the plants around you. But now, for the first time, you have a chance to watch that magnificent dance of pollinators and plants in the far corners of the globe and in the darkness of night. WINGS OF LIFE, the latest documentary from remarkable cinematographer and director, LOUIE SCHWARTZBERG, is now available on DVD. More than beautiful – which it is – the film carries an important message about the threats to pollinators and in turn, the threat to life itself. 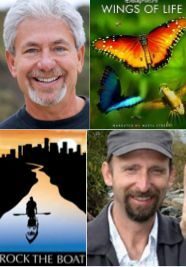 I’ll be joined by LOUIS and CHIP TAYLOR a Monarch butterfly expert. How difficult is it to be a government whistleblower these days? A dozen years after 9/11, with a former constitutional law professor in the White House, the sad news is that to expose government negligence or illegality is to jeopardize one’s career and life savings. The newest documentary from producer and director ROBERT GREENWALD and Brave New Films, WAR ON WHISTLEBLOWERS: Free Press and the National Security State highlights the stories of four individuals who felt compelled to reveal acts of government illegality and violations to the U.S. constitution in the military industrial complex in the years following 9/11. In the film, whistleblowers, journalist and experts share what happens when the government punishes those who stand up to demand accountability and defend the constitution. Such actions and the atmosphere they engender has a chilling effect on the speech rights of citizens and the free press. This week I speak about all of this with GREENWALD as well as with two of the courageous whistleblowers featured in the film, THOMAS TAMM and FRANZ GAYL.